Men driving piles of plastic foam to recycling transfer stations are a common sight in Shanghai, but it's a tough way to make a living because prices are low. 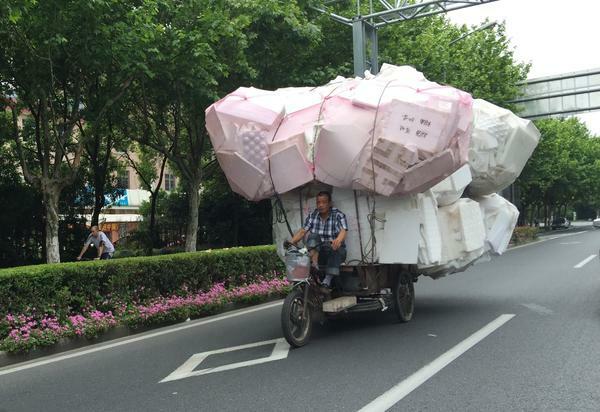 Men driving mountains of Styrofoam on the back of three-wheeled, motorized scooters are a common sight in Shanghai, but the one captured on this video is the biggest I or any of my friends have ever seen. He must be on his way to a recycling transfer station to sell his haul. How he manages to make that right turn without any apparent peripheral vision is yet another miracle of Shanghai's chaotic traffic. I've tried to interview Styrofoam men in the past, but they say they are too busy to talk. They also seem unable to grasp why anyone would find their lives interesting. So, to try to make sense of this remarkable video, I called Adam Minter, who reported on recycling in China for a dozen years while he was based in Shanghai. Minter, who now lives in the Malaysian capital of Kuala Lumpur, is the author of Junkyard Planet, Travels in the Billion Dollar Trash Trade. Minter suspects the man has wildly overloaded his vehicle to cope with changes in Shanghai and the broader economy. When Minter arrived in Shanghai in 2002, the city was dotted with recycling transfer stations that collected everything from empty water bottles to scrap metal. As officials moved to change Shanghai's image into that of a cosmopolitan financial capital, though, they pushed recycling stations deeper and deeper into the suburbs. "When you look at this guy on his bicycle with just that monster load of Styrofoam, my thought is he's got to collect a whole lot more of this stuff to make it economically worth his while to drive it out of town to sell it," Minter said. Styrofoam is eventually taken to a factory that shreds and remelts it, then sells it to manufacturers that use it to make more plastic products. Minter says when he lived in Shanghai, recyclers could generally make anywhere from $400 to $650 a month. He thinks Styrofoam recyclers in Shanghai today must be struggling because Chinese plastic production — like many other industries here — is suffering from overcapacity, which depresses prices. It's part of the broader slowdown in China's industrial sector that's helped rattle stock markets around the globe — and, Minter says, one more reason the Styrofoam man in this video has loaded up his vehicle beyond all reason.